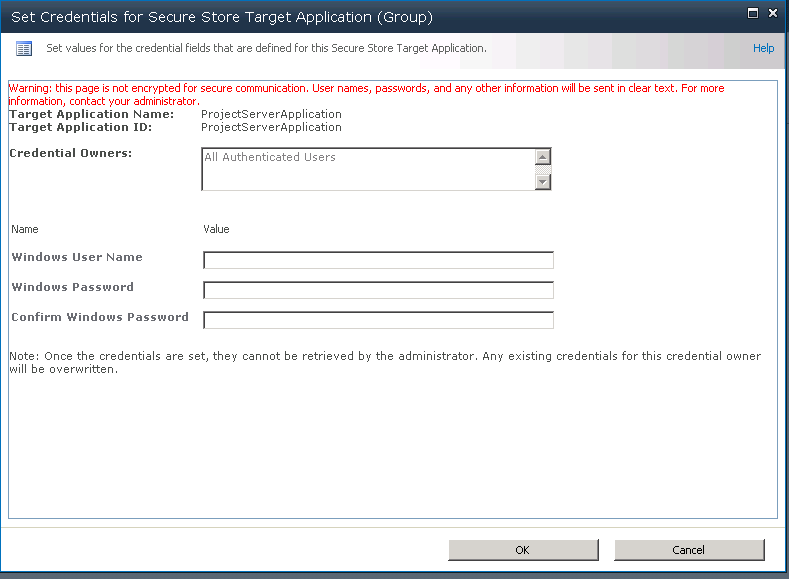 Project Server 2010 uses Excel Services as the primary reporting technology, this post gives an overview on how users authenticate to each data source along with the errors seen if users / accounts don’t have access. There are two different data sources by default, the Reporting database and the OLAP Cube. When creating or editing Excel Services reports the credentials of the logged on user who launched Excel will be used to authenticate the user against the data source. Firstly we will look at the Reporting database reports. To read data from a SQL database the user will need Data Reader (db_datareader) permission against the database, in this case the PWA_Reporting database. The recommended approach from Microsoft is to create a new Active Directory Security Group for Report Authors and add all users who create / edit reports to the this group. This group is then added to the PWA_Reporting database with data reader permissions, this saves adding users directly to the database. Excel will connect directly to the PWA_Reporting database with the logged on users credentials, the logged on user must be a part of the Reporting Authors AD group otherwise they will just see a SQL Server login box in Excel unless they have access directly to the SQL server / database. The same error is seen for each data source apart from the connection name. ConnectionManager.GetConnection: Caught an exception: Microsoft.Office.Excel.Server.CalculationServer.Interop.ConnectionException: Exception of type ‘Microsoft.Office.Excel.Server.CalculationServer.Interop.ConnectionException’ was thrown. at Microsoft.Office.Excel.Server.CalculationServer.Interop.ConnectionInterop.InitConnection() at Microsoft.Office.Excel.Server.CalculationServer.ConnectionManager.<>c__DisplayClass1.<CreateConnection>b__0() at Microsoft.Office.Excel.Server.Credentials.TryExecuteImpersonated(WindowsIdentity wi, ExecuteImpersonatedMethod method, Boolean dispose) at Microsoft.Office.Excel.Server.Credentials.TryExecuteImpersonated. Great post! I’m trying to understand the whole MOPS to SSAS integration; I’ve completed an upgrade from 2007 to 2010 and in inspecting the ProjectServerViewOlapDataRole on the SSAS instance, I find that all three permissions for that role are checked. Of most pressing concern is that inclusive in the three permissions is Full Control. Because I’m a user in MOPS I was automatically added to the role through the MOPS cube configuration (nature of MOPS processes). 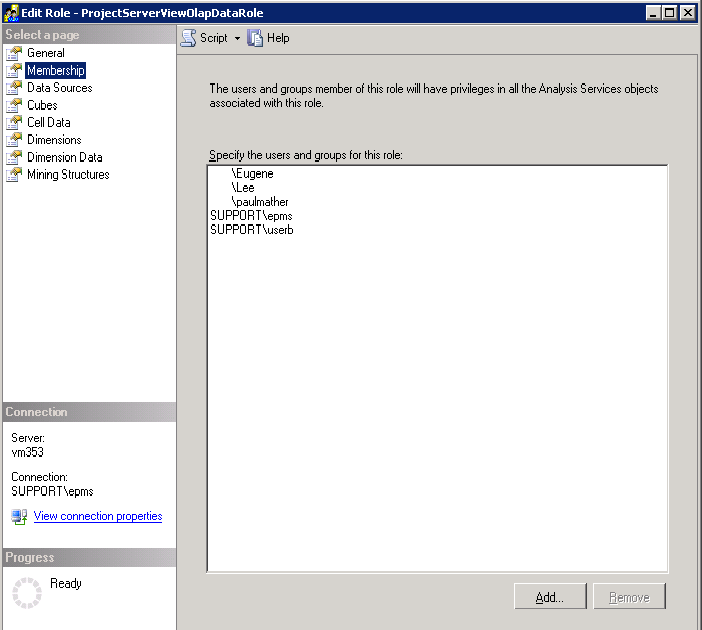 By virtue of the permissions settings in SSAS for the role however, I can connect to the SSAS instance as me and delete/alter cubes and dimensions, as could I would assume any MOPS user. Can I assume that something is amiss here from a security perspective? Thanks for the feedback. The behaviour you see is as expected and I can replicate this with a “normal user” that has only the ProjecServerViewOlapDataRole against a cube in SSAS. Most users will not be able to access SSAS and delete/alter cube as they will not have access to SQL Server Management Studio. This should be the same in Project Server 2007 and Project Server 2010. 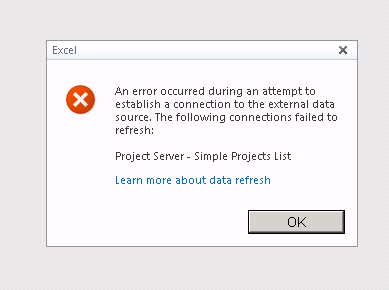 We can open sample reports online using Excel services, but when we try to open in Excel locally, we cannot. We have even tried making sure that the user we are logged on with has the rights to access the Reporting DB directly to read from it, using an excel instance in hte same domain as the reporting database, but this does not work. Deselecting the Trusted Connection option and trying to login using the Farm Administrator account gives me the same error message. From a client machine that is experiencing this issue can you create an ODBC connection to the Project Server Reporting database to test if the user has access to the database? If this doesn’t work, add the user to the Project Server Reporting database with db_datareader access then re-test the ODBC connection and the reports in Excel. We tried this, and it does not work. Same error occurs. So this user is unable to to see the Project Server Reporting database from an ODBC connection or Excel when there account is added directly to the SQL server with db_datareader access to the Reporting database? From the client machine can you ping the SQL server, does this resolve? We even tried setting up a local account on the database server, instead of going through AD, and we got the same results. Can you test from a client machine using the farm service account? Did you provision PWA using the actual SQL server name, an SQL Alias name or a DNS Alias for the SQL server? When attempting to connect from Excel, what shows up in the SQL logs? The only way we can get the data without errors is to access the PWA server remotely, and access the data with Excel or ODBC directly on the server. Its a not a firewall problem: on the fact that the doamin server runs Project Server and SQL Database on the SAME machine makes it a very unlikely a Firewall related problem. Server is at same Internal environment along with our Exchange server and the IPsec VPN link we all use from our office allows ANY traffic. So from a client machine using Excel you can’t access the Project Server Reporting database or the OLAP cube, is this correct? If so, do the connection details have the correct SQL server? Is this the SQL server name, DNS alias or SQL alias?